Will a Semi-Permanent Rinse Damage the Hair? When it comes to hair color, the possibilities are endless. There are several different hair color processes to chooses from, but semi-permanent color is the least damaging, because it does not contain any ammonia and has a low percentage of peroxide or none at all. Semi-permanent hair color is an excellent option if you want to introduce yourself to color, tone down a brassy blond, deepen your existing color (colored or natural) or add shine. Semi-permanent hair color is a gentle hair process that will add shine and a silky feel to the hair. It does not contain any ammonia, therefore preventing cuticle damage. It serves as a barrier against harsh water minerals and heat styling. Semi-permanent dyes also darken the existing hair color and add vibrancy. Since it is a temporary stain, there won't be any roots to contend with. The color gradually shampoos out. 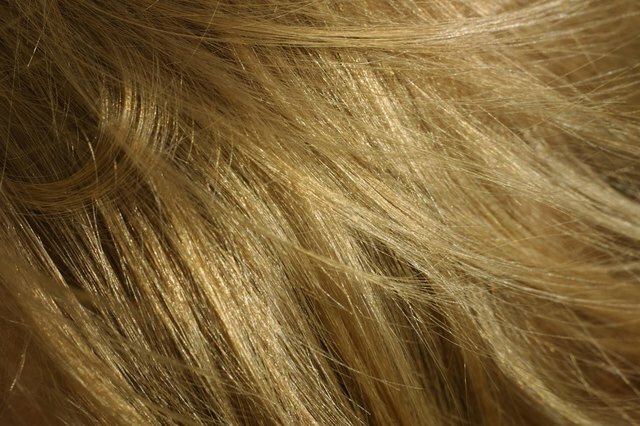 Semi-permanent hair color is used to tone down brassy highlights or to add pigment when highlights have gone too light. It's used to add vibrancy and depth to the hair and also blends gray hair, giving it a natural look. Semi-permanent hair color is not the same as permanent color, in that it won't lighten the hair. Since there is a low percentage of peroxide (or none at all), it won't lift the natural pigment of the hair. It is only used to deposit color onto the hair or darken the hair. 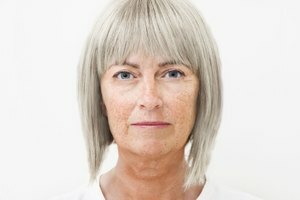 Semi-permanent hair color will not completely cover gray hair. The low percentage of peroxide will not open the cuticle, which is needed for complete gray coverage. Permanent hair color would be the better option for complete coverage. 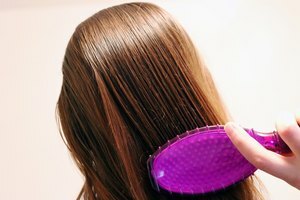 Semi-permanent hair color gradually shampoos out in four to six weeks. The more you shampoo, the sooner it will wash out. You'll still see remnants of the color, but it will be very faint. Before using a semi-permanent hair color, it is necessary to shampoo the hair with a clarifying treatment. This will remove any harsh water minerals and product build-up that may impede the coloring process. Towel dry the hair thoroughly. While hair does not have to be completely dry before application, soaking wet hair will not accept the color. Apply the color starting at the scalp and working your way down the hair shaft. Comb the color through with a wide-toothed comb to make sure the color is distributed evenly. Depending on the color line, it should only need to process for 20 to 30 minutes. Add a plastic cap and heat for a more intense and longer-lasting result. 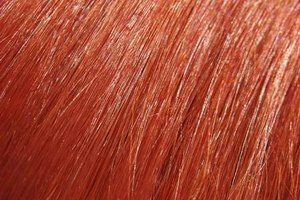 Over-processed hair should be conditioned with a protein treatment before using a semi-permanent hair color. Since the cuticles of damaged hair are swollen, the color will flood into the cuticle, causing it to become too dark. A protein treatment will help to fill in the holes of the cuticle to ensure proper results. Never use a moisturizing treatment before semi-permanent hair color, because it will cause the color to slide off. Kathleen Powell has been a beauty professional for eighteen years and began contributing articles to a salon website in 2005. Kathleen writes for eHow.com and has a beauty blog. She has completed writing courses at Anne Arundel Community College in Arnold, Maryland and is currently enrolled with The Longridge Writer's Group in West Redding, Connecticut.